We would like to make a Video of your Shop! 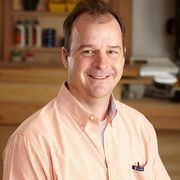 At our meeting on April 9th, Kevin Boyle of WOOD Magazine will present a program on veneering furniture projects. Kevin will demonstrate how to make a simple (but beautiful) book-matched veneer panel. He is an excellent instructor, who offers practical solutions to veneering problems and "demystifies" the process. We look forward to Kevin's presentation. Update: Logged-in Members can follow this link to watch our video of John's presentation. Meeting was called to order by President Chuck Haas. Librarian Eugene Harms reported that the library usage was increasing. Donations of books and magazines were always welcomed; however duplicates would be put out for members to take. Update: Logged-in Members can follow this link to watch our video of Jim's presentation. The president of the local chapter charity, Sleep in Heavenly Peace (www.SHPbeds.org), spoke to the members. SHP is a registered 501(c) (3) non-profit serving children in need. It is volunteer driven organization with 100% of the donations going toward building children’s beds. The chapter recently did a build at the home show, 45 beds were built! The organization needs wood, supplies, tools and volunteers. If members are interested they should contact Chapter President Spencer VandeBerg at 515-954-0678.